Some people like to say Disney is the happiest place on earth. I disagree. Target is the happiest place on earth. And lucky for me, I have three Target stores within 10 minutes of my house. But what’s better than Target? Target’s “Dollar Spot,” that’s what. I always check out the Dollar Spot, just in case and in this case, I struck gold. On a casual Target trip yesterday, I was browsing the Dollar Spot and I realized Target had decided to sell dorm goodies! HOW SMART. I did’t want any of my readers to miss out on this wonderful opportunity to SAVE BIG so I documented all. of. it. for y’all. Be prepared to be bombarded with pictures. These are essentials for dorms. The two laundry bags are great and since you probably won’t need to use them for more than a year, the possibility that they’re cheaply made is not an issue. Each of these products came in at least 2 different colors, and I think the storage basket came in 4. First of all these over the door hooks are great, but because of their price, they might be cheaply made and therefore pretty weak. However these can add a ton of space on the back of any door in a dorm. The knockoff 3M hooks are also very useful but may not be as strong as the real ones. The non slip hangers are awesome because not only do they keep your clothes hangin’, but you can hang them on each other, making more room in your closet. But since these are only 3-packs you may not be getting as much of a bang for your buck when you compare it to 20-packs or so. And finally, the adhesive drawer liner. I personally don’t use drawer liners because the drawers that were in my dorm were clean and didn’t seem nasty. However, if you’re moving into an older dorm I highly suggest these. They came in a few cute patterns. This message board is great, so it won’t take up too much room in your dorm, and you’re able to pin photos to one side while writing to-do lists/reminders/quotes on the other side. I also love this dry erase board, it would be great to hang on the outside of your dorm door so friends could leave messages (I know my hall loved doing this). I’m not sure where the ‘corkboard’ is they mentioned, though. The pocket planner is perfect for someone who isn’t as Type A as me and doesn’t mind a less fancy planner. And finally, this three ring binder/calendar pages duo is absolutely adorable and so much cheaper than any planner on the market. Kind of jealous considering I just bought a fancy Erin Condren planner. These go without saying that they’re absolutely adorable. The clipboard is pretty small (look at it compared to my normal-sized hands) so keep that in mind. And the magnetic list pad would be perfect on a min-fridge to make grocery lists! More cute school supplies! I think those giant paper clips would be great for making your page in a planner or a book, or keeping papers from different classes together. I used (less cute) mini clothes pins last year to pin photos onto my tassel garland and they worked great. And seriously how cute are those scissors? Even though you’re no longer doing arts & crafts for school work, you’d be surprised how much we needed scissors this year. Don’t forget them! I actually had a desk organizer similar to this last year on my desk and it was great to store important papers I wanted to keep in sight and my notebooks. The divided tray would be great to either organize supplies such as paperclips, push pins, etc or organize makeup. The plastic organizer looks like a magazine holder but it doesn’t seem very sturdy so I would suggest using this to organize hair products or smaller journals. The metal bin is great for a small trash can under a desk or even to organize shoes. And finally the storage bin, I think it was plastic so it wasn’t very sturdy but it would be great for organizing in cabinets or closets. All four of these goodies would make great utensil holders or even makeup brush holders on any desk or vanity. The colored tin came in multiple pastel colors and were all adorable. Both of these are great storage solutions for all of your shower needs when you have to lug everything down the hall to your community bathroom. The plastic caddy came in a few colors and is obviously more sturdy than the tote. However the tote seems like it would be easy to hang and keep mold out. This is a great example of something you’re going to want to throw away at the end of the year so what’s the point of paying more money for the same thing? I can’t even express how cute all of the patterns this file folder came in were. It would be perfect for keep receipts in throughout the year and keeping important [small] notes. The dry erase board is another one perfect for hanging on the outside of your door for notes from friends. This also came in coral (aka my favorite color). I know the sequined pencil bag seems a bit juvenile but if you’re anything like me and carrying around a bajillion pens to use in your planner + pencils + calculator.. it all adds up and you’re going to want to keep it in one place. This is the perfect solution. The file folders are great for keeping papers from your classes straight. The tumbler is super cute and easy to grab some iced coffee in from your Keurig and head to class. And finally the magnetic clips are adorable and great to hang stuff of a minifridge, or keep chip bags closed or even to keep papers on magnetic boards. The options are endless. These two are essentials for any crafter or decorator. Why not get them while they’re cheap. The tape comes in packs of two which is great because you will run out fast. Okay how cute is this burlap banner!? This is actually the only thing I bought from the Dollar Spot this trip (don’t worry- I’ll be back) because it’s so “in” and easily customization. It has six panels and you could keep it plain or add letters or picture on it and it’s instant dorm decor with little to no work! The wood banner is already decorated with “smile” written on it; perfect for any optimist! The chalkboard clips are soo cute, they could hold up photos or other memories as decor or be put to use to keep papers together, either way they’re so perfect and even come with a piece of chalk! Lastly, the clip strip. I was extremely close to buying this as well. It has hooks on the back so you’re able to hang it and it basically looks like something straight out of PBTeen. I would totally use this to hold photos, but it could also be used for papers or artwork! That’s the end of my bombardment of photos but I hope you saw something that you can use in your dorm. Just a warning, I may have been incorrect on some prices but they are all either $3 or $1. And this was just what I saw in my Target store, yours might have more or less! 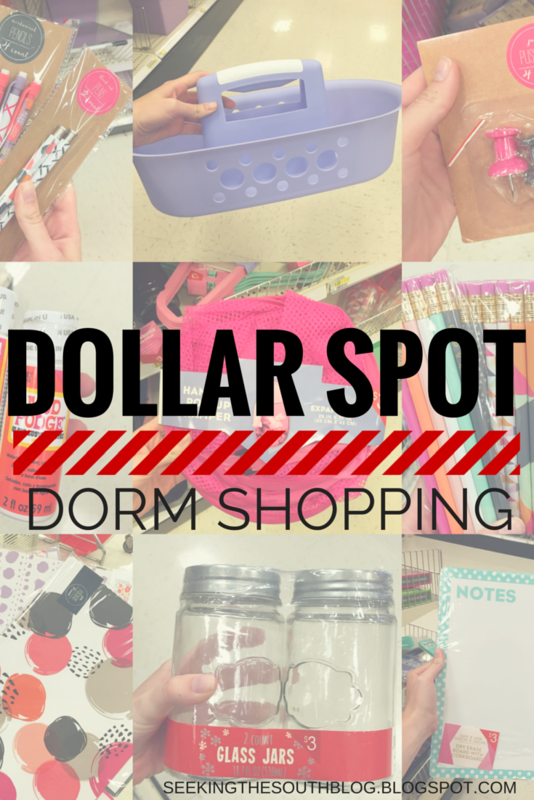 Let me know what you found at your Dollar Spot!And don’t forget to check out my other dorm posts!